It is vital to understand weights when it comes to shipping goods. Weight is used to determine shipping costs regardless of whether the shipment is made by sea, air, rail, or road. The paperwork, quotes, and bill of lading will clearly indicate which weight the costs are based on for that shipping company. Gross weight, net weight, and tare weight are all commonly used terminology for shipping purposes. To fully understand how gross weight and net weight is calculated, it is necessary to define tare weight; tare weight is the weight of the packaging or container in which goods will be shipped, that is, as an empty unit. For example, a tin into which baked beans would be placed – the weight of the tin is the tare weight. If the tins of baked beans are then placed into a box of 24 units, then the box will also be part of the tare weight. For freight companies, there is a clear relationship between the gross weight, net weight, and tare weight of a shipment. It is the buyer’s responsibility to understand the differences between the weight terms in order to understand the paperwork supplied by the freight company and to avoid a potential misunderstanding. The word gross means total. Thus, gross weight means total weight. The gross weight will include all aspects required for shipping. It includes the actual product, its packaging and any other packaging required to enable the shipping of the product. Gross weight for air transport is calculated as the product weight plus the packaging weight plus the weight of the crew and passengers, fuel and aircraft. Gross weight for transport by road or rail is the product weight plus packaging (tare weight) plus vehicle or wagon’s weight. Gross weight for transport by waterway is calculated as product weight and package or container weight (tare weight). Net weight refers to the weight of the raw product and does not include the weight of the products packaging or container. For example, the weight of sardines before being placed into tins. The net weight is equal to the gross weight minus the tare weight. Net weight can also refer to the weight of goods that have been packed into a container but do not include the container’s weight. Gross weight is the total weight of goods, including the raw product, any packaging, and possibly the vessel transporting the goods. Net weight is the raw weight of the product only without any packaging. Gross weight = net weight + packaging/ container weight. 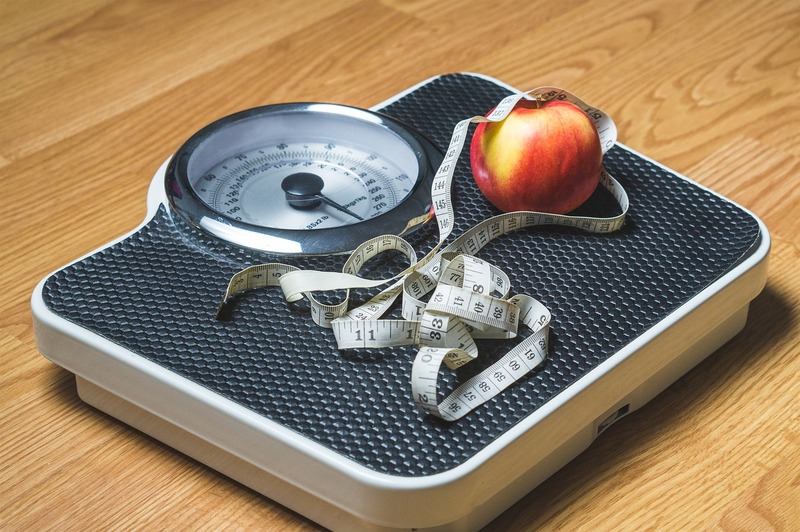 Net weight = gross weight – tare weight. Tare weight is the weight of containers and packaging within which the raw products are shipped. 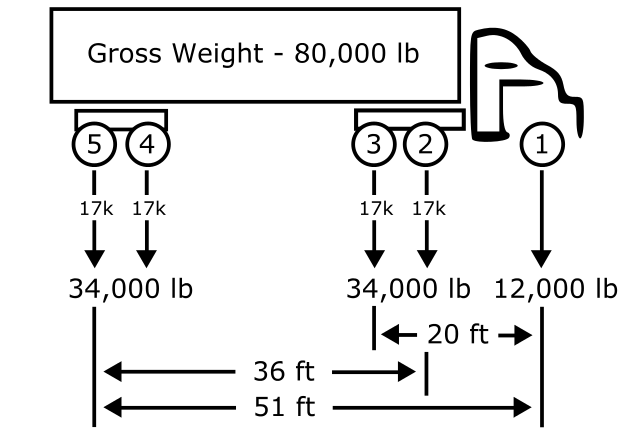 Gross weight includes the tare weight but net weight excludes the tare weight. A thorough understanding of shipping weights is necessary to understand quotes from freight companies. Gross weight is the total weight of the shipment, including the raw products, its packaging, pallets, containers, and weight of transport vehicle. Net weight refers to the weight of the raw product ordered. It does not include the weight of any container within which the product is held (e.g. a tin or box) or subsequent weight of pallets, larger containers, or the transport vehicle. Tare weight is the weight of the packaging or container in which goods are shipped. 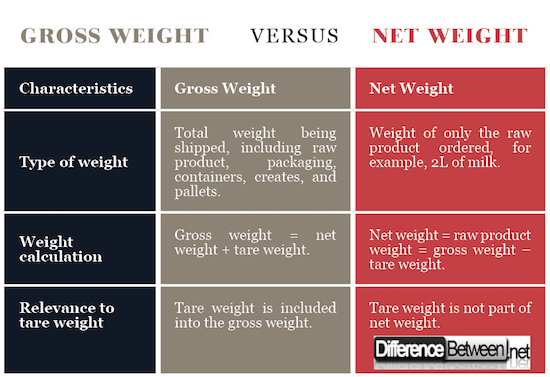 Tare weight forms the basic difference between the gross weight and net weight of a shipment. Gross weight and net weight should be clearly identified on shipping documents such as the quote, bill of lading, and other shipping documentation. Ivannih Jooste. "Difference Between Gross Weight and Net Weight." DifferenceBetween.net. August 14, 2018 < http://www.differencebetween.net/science/difference-between-gross-weight-and-net-weight/ >. “Gross weight.” BusinessDictionary.com. WebFinance, Inc. Web. 1 May 2018. www.businessdictionary.com/definition/gross-weight.html. Manaadiar, Hariesh. “Difference between the various weights used in shipping.” Shipping and Freight Resource. Hariesh Puthan House, 19 Oct. 2011. Web. 1 May 2018. shippingandfreightresource.com/difference-between-the-various-weights-used-in-shipping/. “Net weight.” BusinessDictionary.com. WebFinance, Inc. Web. 1 May 2018. www.businessdictionary.com/definition/net-weight.html.